Elk Lake Creek is a pristine fork of the Collowash that descends out of the mountains through at least two difficult gorges before the confluence. Dan Coyle and others began checking out this run as early as 1999, and in 2000 or so they finally ran it. I had heard stories about the horrendous portaging and big falls in the crux gorge, but that didn't dampen my interest. Elk Lake Creek descends through a wilderness area, so you have to hike in if you want to paddle it. 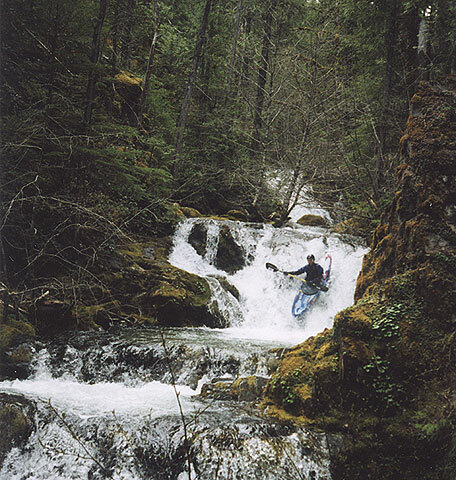 Finally, in the spring of 2002, we decided that we had to see what the Elk Lake Fork was all about. Pete had visually confirmed that the creek was at an optimal medium flow the week before, so on Sunday, May 19th we loaded up and headed up into the Bull of the Woods Wilderness full of anticipation. After carrying our boats about a mile up the trail we arrived at the two waterfalls that mark the start of the lower gorge. We scouted them carefully and they looked pretty good. At this point we weren't sure about how much higher we should go before we put in. We knew that there was another, steeper gorge upstream (gradient: 500 fpm for one mile) but we weren't sure we wanted to carry our boats another three miles for what might be too steep (or too wood-filled) to run. After a short debate, we decided to hide our boats above the first gorge and go fast-and-light up the trail to see if there was anything worth paddling upstream. The hike up above the first gorge was very scenic (worth doing even if you aren't going to paddle the creek) but the trail was blocked in a few places by downed logs. We portaged these pretty easily without our boats, and made good progress. Soon we arrived at a tributary of Elk Lake Creek, which the map called 'Welcome Creek'. As we rounded the corner, the wall of white on Welcome took our breath away. "Well, hot damn, lookit that." I said, grinning at Pete. "Looks like we're bringing our boats up for sure now.."
To our surprise, Welcome Creek was roaring off of the mountainside over at least two waterfalls that we could see from the trail, and who knows what was upstream? After a quick recon, we rushed back down to get our gear. After a half hour or so we were back up on Welcome Creek. As we were getting ready, Pete discovered that his spraydeck was missing. He was sure that it had been in his boat, so he took off back down the trail at a run. Forty five minutes later he rounded the corner, spraydeck in hand. It had fallen out of his boat, and some helpful hiker had dutifully carried it allll the way back down to the trailhead and hung it from the sign! Pete was a little winded after his four-mile bonus run, but after a short break he geared up and we got ready to go. 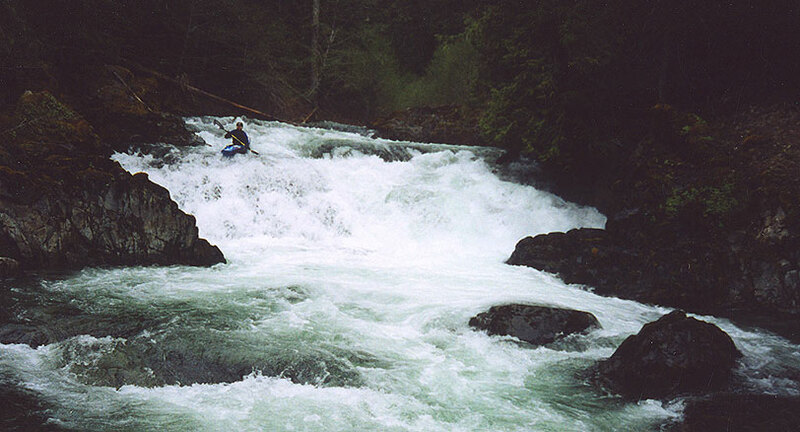 The first drop on Welcome Creek is a twenty-foot near vertical falls with an underwater shelf that juts out on the left side, just waiting to penalize a careless paddler..
Pete runs the first drop on Welcome Creek. Below the second ledge Welcome Creek dropped away through a steep boulder garden that ended abruptly in a pile of logs. We portaged this mess on the right, and then dropped onto Elk Lake Creek. At this point we were feeling pretty good; Elk Lake had plenty of water, and it was shaping up to be a fine day of boating. After a few twists and turns ( and one log portage ) our enthusiasm dimmed somewhat; the section above the first gorge was never harder than class III, and though it was scenic (with wonderful crystalline-green water) it wasn't worth hiking for! 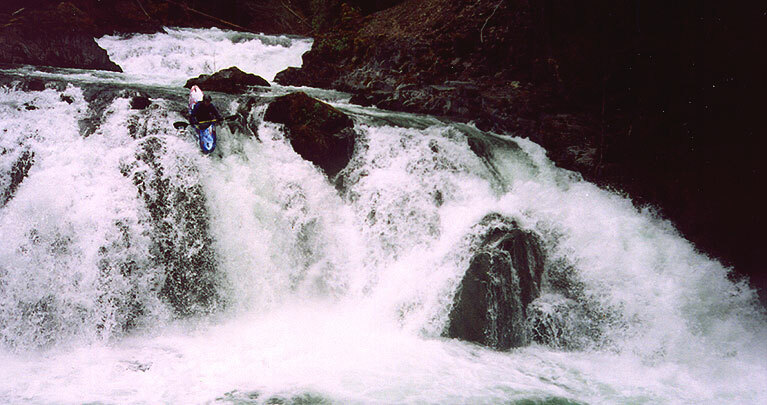 Pete runs the first falls, shot from the lip of the main falls. 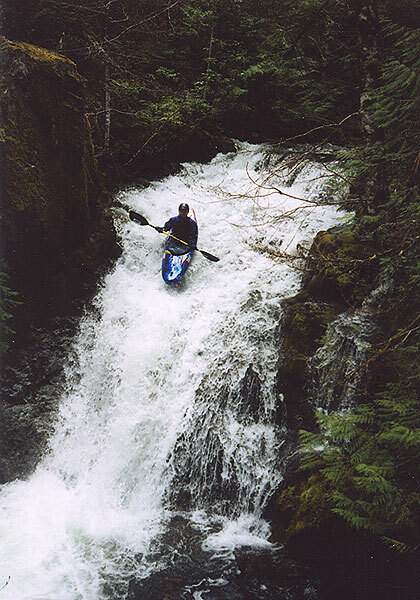 Just downstream of Elk Lake Falls the walls shot up and we got out to scout the first drop in the gorge proper. It looked good, but once again there was no margin for error. 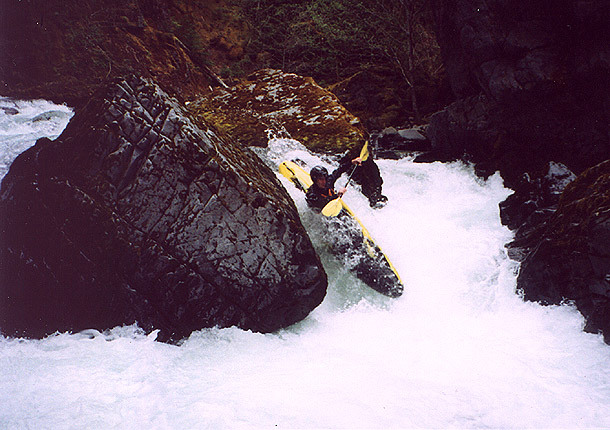 Here the water rushed down over a technical lead-in to a large boulder dividing the current. The creek split at this boulder, dropping about six or seven feet into a pool below. The right side of the boulder dropped into an evil-looking undercut wall with a log wedged in it for good measure, and the left side dropped into a meaty-looking hole. There was no way to set up safety here, so Pete shrugged and said: "I'll go first, I guess... just make sure I'm not in that hole before you come down..'. Pete got into his boat and as I watched he cruised the first part of the drop, starting left, working right, then cutting back to the left above the main drop. He dropped out of sight, and then after a long five count he appeared in the pool below and gave the thumbs up..
Pete makes 'the move' a mandatory left-to-right ferry to avoid the nasty undercut, wood-filled slot visible on the right. I went next, and got pushed a little too close to the nasty slot on the right (all of the current is going there) before I cut back and dropped over the left side of the boulder.. The hole was bigger than it had looked, and I disappeared for a few seconds, emerging in the pool below with wide eyes, much to Pete's amusement. "I was under there for awhile too." he said, grinning. "What a great drop!" I replied.. The author drops the left side, into a big, soft hole.. Fun stuff! Pete was right, in a sense. 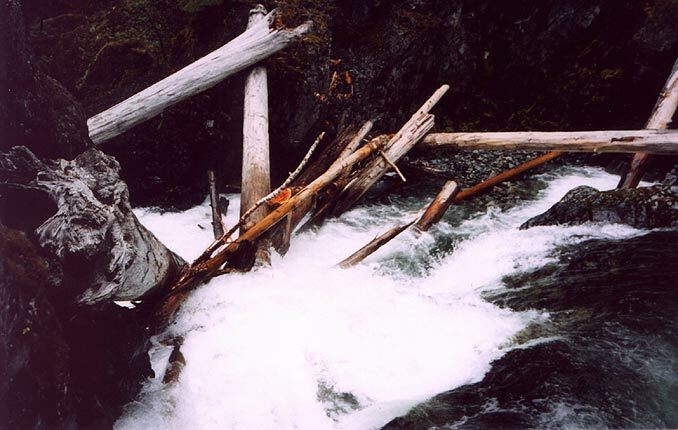 There WAS a way around the jam on the left, but the slightest slip and you would fall onto a pile of logs with 400 cfs pouring twelve feet onto your soon-to-be carcass... 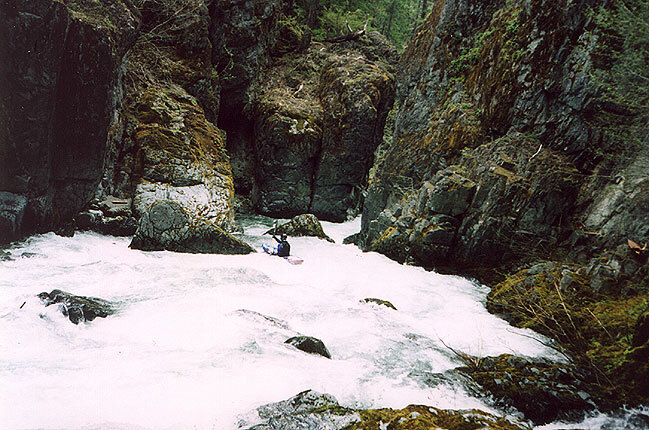 I took one look at that horrendous traverse and said: "Ummm, Hell No... looks like we're gonna have to reverse-portage back upstream and climb up and around this mess..."
So we reverse-portaged back up through the gorge, and it was Not Fun at all! After about 30 minutes of rock-climbing and steep scrambling, we managed to haul our Gradients (aka 'Portage Pigs') up out of the gorge and then around the jam. We put in below it, and paddled out.